Get training for a potential run for elected office or as a campaign leader. Organizations and individuals train women in candidate skills, like public speaking. 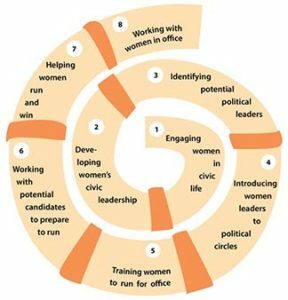 They train women and their teams in the “how” and “why” of good campaigns, including messaging, targeting fundraising, and field campaigns. Carin Schiewe works with progressive organizations, campaign teams and aspiring candidates to master the full range of campaign skills, with a particular emphasis on planning, strategy development, and campaign systems. She focuses on movement–building community campaigns. Emerge Massachusetts runs a comprehensive 6-month training program that gives Democratic women the skills they need to run effective and successful campaigns. The curriculum includes public speaking, fundraising, media relations, field, ethical leadership, diversity in politics and more. Mass Alliance trains progressive women (and men) to prepare and run for elective office or to be campaign leaders. The Getting Ready to Run Training helps women plan and prepare for a future run. The Grassroots Campaign Training covers strategy and message as well as nuts and bolts of great campaigns. ¿Oiste? delivers two non-partisan campaign training per year, focused on Latina/o candidates. Suzanne Lee works with Mass Alliance, Emerge, and CPPA to give training workshops around base-building and political campaigns.